Sorry... the 2016 BMW M6 Gran Coupe is no longer being sold as new. Subtle updates grace the 2016 BMW 6 Series, which, typical of BMW, still comes in all manner of styles. You can get a 6 Series coupe, convertible or four-door Gran Coupe. Three engines are offered along with rear- or all-wheel drive. Top among them is the high-performance M6 model, which can still come with a manual transmission to please the sports-car traditionalists. BMW's twin-kidney grilles have nine bars apiece on the 640i and 650i, down from the prior 10, while the M6 gets its own twin grilles with six pairs of bars apiece. All cars have new scalloped cutouts on the headlights' inboard sides; adaptive LED lights are standard. The largest visual change comes in the lower bumper, where the opening now expands at its outer edges like on the BMW 4 Series. LED fog lights cap the flared edges, with unique surrounding trim on the 6 Series convertible versus the coupe and Gran Coupe. An M Sport Edition returns with 20-inch alloy wheels and some exterior modifications. The M6 has more aggressive bumpers with three separate openings. It's similar to the 2012-2015 M6, which makes the 2016 M6 harder to tell apart. A carbon-fiber roof comes on the M6 coupe and Gran Coupe. In back, six-cylinder models also have larger tailpipe openings. All models have reshaped side mirrors, which BMW says are more aerodynamic. As before, the 6 Series' interior features a sweeping dashboard contour that stretches from the passenger side down to the center console; the entire dash can come wrapped in leather, with an open-pore finish if specified. A semi-floating screen perches above the center air vents. Both the coupe and convertible seat four occupants; the Gran Coupe seats five. A navigation system and heated front seats with power adjusters and memory settings are standard across all 6 Series models. The leather upholstery in the convertible has a reflective treatment that reduces the heat given off during sunny days. The Gran Coupe's backseat has optional seat heaters and side-window sunshades. BMW's familiar iDrive system carries a touchpad atop the knob controller. Premium audio options include Harman Kardon or Bang & Olufsen stereos. Engines carry over with a 315-horsepower, turbocharged six-cylinder engine in the 640i and a 445-hp, turbo V-8 in the 650i. Both engines drive the rear wheels through an eight-speed automatic transmission. BMW says its optional xDrive all-wheel-drive system improves acceleration, with the 650i xDrive coupe and Gran Coupe hitting 60 mph in 4.3 seconds. A new exhaust on the 640i, meanwhile, makes for a more aggressive sound. Drivers can adjust it through BMW’s Driving Experience Control system, which changes the exhaust note, among other systems, to Comfort, Efficiency or Sport settings. Optional suspension setups include adaptive shock absorbers, as well as an active suspension that counters body roll in real time. Other systems include rear-wheel steering, which BMW says aids steering response and reduces the turning circle. 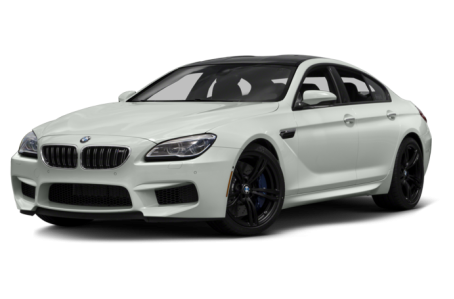 The M6 employs a turbocharged V-8 that’s good for 560 hp. It drives the rear wheels through a seven-speed dual-clutch transmission or a six-speed manual, which is rare these days among luxury sports cars. The M6 is available in all three body styles. A standard active rear differential routes power proactively between the rear wheels. High-performance carbon-ceramic brakes are optional. A night-vision camera system is available; so is lane departure warning and adaptive cruise control with full-stop capabilities, pedestrian warning capabilities and auto-braking forward collision warning.